To lift people out of poverty through employment. Begun in 2005 by social innovators Mr. Peter Cove and Dr. Lee Bowes of America Works, the Work First Foundation was founded on the idea that employment is the most important first step towards lifting people out of poverty. We run programs that offer job opportunities to under-served populations, conduct research based on these programs, and administer a fellowship program for young professionals interested in public policy. The foundation also engages in advocacy efforts that promote economic self-reliance for needy individuals and produces research on ways to improve access for low-income individuals' entrance to the workforce. Today, we operate in New York, San Francisco, Milwaukee, Westampton N.J, Washington D.C. and Baltimore, conducting demonstration programs that connect disadvantaged job seekers to opportunities. The Work First Foundation is a 501(c)3 nonprofit. Out of work and on public assistance for more than three years. Individuals placed into the workforce by the Work First Foundation. Of placed workers retained in our wage subsidy program. The Work First Foundation conducts demonstration programs that help unemployed individuals gain and retain jobs. 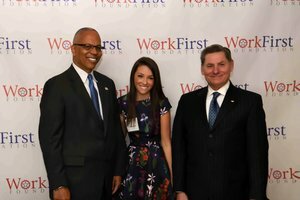 Notably, the Work First Foundation has operated three successful employment demonstration programs in New York City, Washington, D.C., and Baltimore, Maryland. The Work First Foundation seeks to identify approaches that successfully lead to meaningful employment for people on public assistance. As part of our mission, we collect data on effective employment programs around the United States so that government, job seekers, employers and private funders can make informed decisions on which programs to partner with. The Work First Fellowship is a year of service that combines direct support to individuals living below the poverty level with research on the public policy that shapes the lives of the population they serve. The fellowship operates in New York, NY, Baltimore, MD, Westampton, N.J, Washington, DC, Milwaukee, WI, and San Francisco, CA. If you are interested in fighting poverty through employment, we offer several opportunities to get involved. You can join the Work First Fellowship Advisory Council, become a Game Changer, or make a donation to help us connect people with employment.